Sold by ComfortTac and Fulfilled by Amazon. Gift-wrap available. RIGHT OR LEFT HAND DRAW - Bellyband Holster is available in right and left hand draw. Fits Glock 19, 23, 38, 25, 32, 26, 27, 29, 30, 39, 28, 33, 42, 43, 36, M&P Shield, Sig Sauer, Kahr, Beretta, Springfield, Taurus, Bersa, Kel Tec, Walther, and more. Sold by ComfortTac and ships from Amazon Fulfillment. Sold by Concealed Carrier and ships from Amazon Fulfillment. 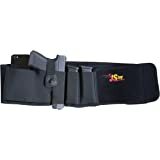 - Are you sick of holsters that are uncomfortable? 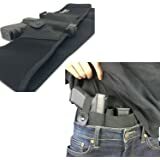 - Does your current holster require you to wear a belt and limit your wardrobe? 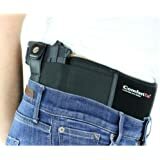 - Do you want to carry concealed and be comfortable? 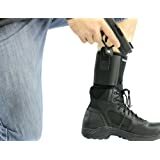 - Do you want to be able to carry different guns for different situations? Introducing The Ultimate Belly Band Holster. 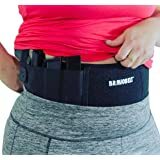 If you look at other belly band holsters you will see that almost all of them are made from elastic. Unfortunately that is not the best material to make a holster from. It turns brittle after getting wet repeatedly, it has a tendency to pinch your skin and body hair resulting in pinches and pulls, and is uncomfortable against your skin. Neoprene on the other hand is soft against your skin which is why it is used in knee braces and back braces. Neoprene also is thicker and handles the weight of a gun very well. It provide more comfort and support resulting in a better product. Sizing: The belly band holster measures 5" wide x 42.25" long and will comfortably fit a 44" diameter. To ensure a comfortable fit simply use a tape measure and measure the area you intend to carry. If around your waist simple measure your waist and so on. Holster Sizing: The surgical grade elastic holster is flexible and will fit just about any pistol you own up to a full size 1911. Small "pocket pistols" may sit deep in the holster, so if you intend on carrying a small pocket size pistol be sure that it is secure and that you can get your hand on it to draw. Don't miss out on your opportunity to own the ultimate belly band holster. Click Buy Now to order yours today! 30 Day Buy & Try Money Back Guarantee. Buy it and try it for up to 30 days. If you are not 100% satisfied return it for a refund of your full purchase price. 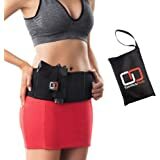 5.0 out of 5 starsFinally something that works for small women! I'm 5"5 and 118 pounds, and I've tried many ways to conceal my 9mm S&W shield. If you're a small female, it's nearly impossible. However this product is the closest I've gotten to being able to conceal and being almost completely unnoticeable. The band itself is comfortable, but if you're not used to wearing something of weight on your belly/hips, it might take some getting used to. I'm an army medic and I'm used to the weight of my gear, so I think this belly band is pretty comfortable. It does make me feel a little fat when I'm sitting down though. 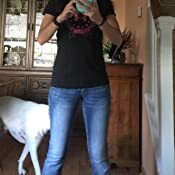 If you wear tight pants or jeans (like I am in my picture) you'll have to wear the band higher up on your belly because if your pants overlap the end of your pistol then that pushes the top outward and then you have something sticking out under your shirt. So I found that not wearing the band halfway under my pants (like in the product picture) works better for me. I still can't use this product to conceal on my hips/sides. It's noticeable. I wear it in the center, right over my belly button. Also if you wear it half underneath your pants it blocks access to the clip to the strap that's over your pistol. However I gave this product 5 stars because I can successfully conceal in at least one way. It did take me a couple days of playing around with it to figure out what works best. And the tighter the better- the tighter you Velcro the band to you, the closer it holds the pistol to your body. Center, up and not under my jeans, and tight works best for me. 5.0 out of 5 starsBuy this, ladies! Be safe! I am a bigger girl and I have a hard time concealing my glock 43. (I know, you're like, "but how?) I found this as I was browsing the other night and thought I'd try it. I received it today and I tried it on and it fits so incredibly perfectly, I am blown away. It is very high quality! As most people know, concealing a weapon on our person as women is hard, seems as though all the leather holsters and whatnot are just simply made for men. This, on the other hand, is more comfortable than I ever imagined and the extra magazine slot makes it even better! I jumped up and down, twisted my hips quickly and the band (and my glock 43) stayed entirely in place. My boyfriend was concerned about it only having elastic to hold it in place with the slide clasp to go over the back side, but I seriously love it. He always says to me however I am most comfortable carrying is how I should, and this one will be my every day holster. I have an inside the waistband holster and a leg holster too, for any occasions where this one might not work, which honestly all I can think off is for when I wear a dress. When it says "up to 48 inches" I measured right at 44 and I can tighten or loosen it easily, which is another huge plus. 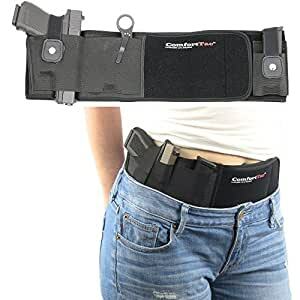 I honestly can't say anything bad about this holster, when I saw it said, "one size fits all" I thought I'd surely fall out of that frame, but I didn't, and I adore it! 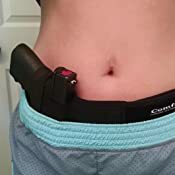 I no longer have to worry about my pants falling down from my inside the waistband holster, because this baby stays in place! And I don't even like the idea of a "purse holster" because the time it would take to draw your weapon could mean life or death... This is a lifesaver! Definitely recommend! 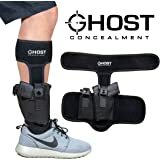 As a member of the law enforcement community, I am constantly looking for something that will aid in concealment (especially when off-duty) and purchase products that appear to be able to aid in this concealment. 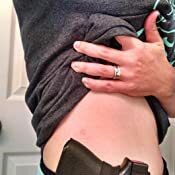 In the case of the Belly Band holster, it definitely has some pros and cons. I have only used this with a Sig P229 for size reference. For activities like running, the "mag pouch" is perfect for placing cards and IDs. You can move it up and down your torso and rotate it around to find the most desirable placement. The "mag pouch" was nearly useless for actually holding mags. Tried having one and two mags in it and they both were squeezed out with just regular movement and bending over. The positions you can have it in get very limited with normal movement and if carrying bags (such as a backpack). I found myself moving it around to adjust it more than I would have liked. I do not like the clip for the restraining strap. I am sure with some practice I could become quick with deployment, but freeing the firearm will either take 2 hands or you'll have to pull the tab with your shooting hand and then move your hand into position to draw. I'd prefer something that can break away as the hand comes to the grip (a true thumb break). I know there are many points were it is stated that many remove this strap all together, but I wouldn't trust the retention of the material alone without it. 5.0 out of 5 starsSuper comfortable holster!! This is a great fit!! I have always carried concealed in my purse or car, but with the crazy times we live in, I decided to start carrying on me. I didn't want to spend a lot of money and loved that this one had a clip, instead of Velcro (for noise). This holster is soooo comfortable!! I purchased a medium but could have gone with a small. I do have to wear it in front of my belly if I'm wearing a T-shirt to conceal it, but with a sweatshirt I wear on my hip. 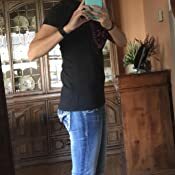 I am 5 2' and 135lbs, small frame. So petite women might want to size down. Thank you for making me feel safe!